A large low pressure zone centred over New Zealand is moving slowly to the east. On Saturday the light northerlies over the North Island should shift more to the southwest for the area from North Cape to the Bay of Plenty. The winds may be more easterly from Porangahau to Wellington. The South Island should have southerly winds. The forecast for North Cape to East Cape is for moderate southwesterly winds. For the remainder of the North Island and all of the South Island the winds are expected to be southeasterlies. 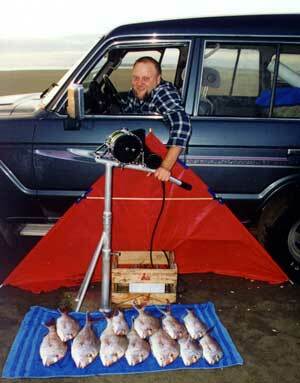 I have a house at Ninety Mile Beach where I do a lot of fishing. I was fishing this week at Tunutunu beach south of Ninety Mile Beach. This beach can only be accessed by 4 wheel drive vehicles. We caught ten kahawai and one snapper. The smoker was fired up that night. The next day, on the 6th August we drove to Rarawa beach as the wind changed to the southwest. We put out two sets of ten hooks. On the first set we caught five snapper and one kahawai. The second set we caught seven snapper and two kahawai. Three of the snapper were undersize and were returned to the water to fatten up for next time. The electric winch I have can either be connected to the wheelchair or fished as a stand alone unit. 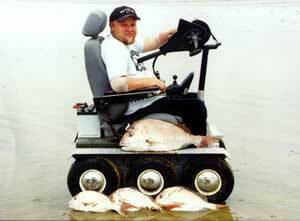 The photo on the right is me in my six wheel drive wheelchair and was taken while fishing on Ninety Mile Beach. 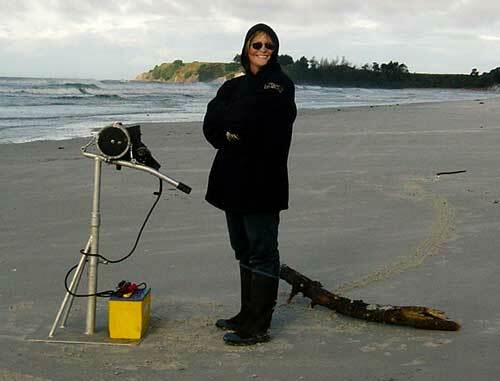 The photo below is Emma (my partner) standing with my 14/0 electric reel on Rarawa beach. I am back in Auckland for while but will be heading back to Ninety Mile Beach for some more fishing soon. Peter Berry and I were at Uretiti last Sunday fishing with his Kite Longline Rig. We set his gear between 800 and 1000 metres out. One set was put out right on top of a reef so Peter decided he would leave it there to see what he caught. He made a good decision as he managed to catch one gurnard and almost his limit bag of snapper. The snapper were good sized fish with the bigger ones being around four to five pounders and the biggest was seven pounds. The good news is there was no sign of the red sack weed last weekend. Hopefully we have seen the last of the weed for the season. I will send photos of Peter's catch once I have the photos developed. Peter went back to Uretiti Beach on Monday with his kitefishing rig. He had no luck with the fishing but saw the most amazing sight while on the beach. There were 2 dolphins herding a mass of either mullet or kahawai on to the beach. The fish were literally airbourne and launching themselves high and dry on the beach trying to avoid the dolphins' attention. The breakers on the beach kept taking the fish back out into the surf where the dolphins were feeding. One of the dolphins actually beached itself while chasing the fish. Luckily it managed to work its way back into the water. Peter says it was so spectacular to see the water exploding with panic striken fish desperately trying to escape the predators. Later that night I took Peter flounder spearing. We managed to spear one. At 14 inches long, it was a great yellow belly. Peter was a very happy chap going home with snapper, a flounder and some beautiful Kaipara oysters. Weatherwise we had very strong northwest gales over the weekend. On Saturday and Sunday there were 5 or 6 kitefishers and one kontiki fisher out trying their luck in the 130km per hour winds (65 knots!!) we had down here. We all knew these gales exceeded Paul's specified wind range for the kites but I rang Paul anyway, to see if he had any ideas to help with flying the kites in the gale force winds. We had launched both the Flexiwing and the Super Kites Rigs, but were experiencing problems keeping them up through the extreme wind gusts. Paul suggested that the Flexiwing Kites should be able to withstand these gales the if a bigger drogue (shopping bag) or extra drogues were attached. He also advised us to use stronger rubber bands. Harry Job modified his Flexiwing and successfully fished in the difficult conditions. Merv Gollan and mates and our local Trev Sciascia were using Super Kites which appeared to handle the extreme gusts much better than the Flexiwings and only a few 10mm tawa spreader dowels were broken. Paul stocks 12mm dowels for those who wish to fish full storm force winds and suggested plastic shopping bag drouge be fitted to Super Kites in really turbulent gale conditions. After mastering the extreme conditions the fishing was incredibly productive but not what we had hoped for, over 100 spiny dogfish were caught, at times every hook had one on! A few gurnard and kahawai were caught and one of the guys even caught a skate. On checking the sea water temperature yesterday I noted it was 15deg C. This is very high for this time of the year, can anyone throw some light on why the sea water temp is so high down here? Don't forget our kahawai fishing contest is on, we had a few weighed in on the weekend but the standings still stay the same. If you are in the area and are looking for a Kite, check out our full range of Pauls Kites on display. Getting back into longlining after a 15 year break. I bought a kite from our local tackle shop believing it to be a Paul' s kite. Never again will I be tricked like that! Even their website is very similar to yours. It flew into the water twice and the line broke so I have made a couple of diamond kites that work well. That is what I used years ago. I am saving up for a Flexiwing Kite. I have learnt a lot from your website and check it weekly. ED Thanks for identifying the kite maker and shop, I have decided not to publish them at this time. I happened to be staying with friends at Waimarama, and just happened to take my kite with me! The wind was very strong southwesterly most of Saturday, but moderated and shifted to an offshore westerly about 4pm. Thats when I ambled down to the surf club and set a perfect 450m directly offshore. Half an hour later I retreived my gear and found 1 spiny dogfish, hardly surprising as the sea was filthy after 10 days of 3-4m swells. Access to the beach is limited at both ends by streams unless you are keen enough to strip down and wade across them, not a nice prospect in winter but fine in summer. It is a sandy beach with no snags that I am aware of. I fished the left hand (wharf) end without crossing the stream, with a Flexiwing Kite and Dropper Rig to a distance of about 600m. At this point the wind swings around and has a tendency to drag your kite towards the cliffs. This can be a little nerve racking if it is the first time you have tried kitefishing. It does go back out to the centre of the bay as it gets further offshore. In strong winds a lot of trawlers can be sheltering in the bay and this limits the distance you can set your kite out. Wading the stream and launching from the middle of the beach would solve both these problems. If the wind is more southerly try Te Araroa about 10kms away. This is a rocky beach with good vehicle access and good snapper to be caught along with a lot of sharks. I have only used a surfcaster at Te Araroa but a lot of local people use kontikis there. Hatfields Beach is easy to fish in both a southerly and a northwesterly wind. It is free of snags if one stays near the centre of the beach. I have seen other kitefishers do well here with catches of small snapper, kahawai etc but I have not had a good strike here myself yet. Hatfields Beach has advantages that it is close to Auckland and accessible. Kitefishers should think in terms of 1500 to 2000 metres of mainline. There can be red weed there that makes kitefishing difficult. If present, it can slow down the setting and retrieving of gear. We have refined the navigation throughout the site and everything (over 200 pages) can now be easily accessed from the home page. We have also added a currency converter for our overseas customers.